Upon arriving at the UW, Lauren Riefflin (B.A., 2009) thought she wanted to be a business major, but after a few economics and accounting classes realized it wasn’t quite the right fit. She started to explore introductory communication classes – both intra- and interpersonal, public speaking, and rhetorical theory – and became really intrigued. Since she grew up doing a lot of theater and loving drama classes, it wasn’t a surprise to her that she made Communication her major. She was a member of PRSSA and very involved with her sorority, Kappa Delta, where she participated in fundraising events and activities to support two philanthropies. 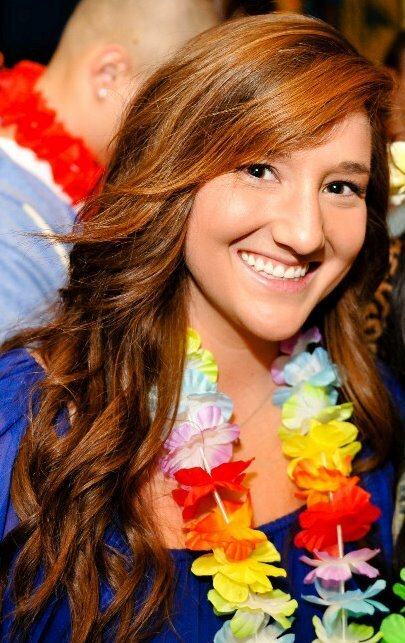 She was a Recruitment Councilor with Panhellenic, the umbrella organization for UW’s sororities, during her junior year. “Directly after graduation, I wasn’t entirely sure what I wanted to do professionally. I didn’t study abroad during college either, so those two factors combined really piqued my interest in traveling. I ended up joining a teaching abroad program and spent 3 months teaching English in Taiwan to Jr. High and High School students, which was an incredible experience. “After my stint in Taiwan, I came home and started researching entry-level jobs in marketing and public relations (my older sister was in the public relations industry at the time so she gave me a nudge in that direction). I came across a PR internship for a real estate tech company, Zillow, and applied on a whim. I came to really enjoy the real estate world earlier in life, with my first job being a receptionist at a Windermere branch in high school. I worked in client services for a boutique brokerage my first year of college as well. When I came across a PR internship that was real estate-related, I thought it married my real estate and PR background pretty well. What do your duties include at your current job? “Zillow’s acquisition of NYC real estate company, StreetEasy, triggered my move out east. Most of my time is focused on developing and executing PR strategy for StreetEasy specifically, which includes reactive and proactive responsibilities for internal and external communications. I work across various departments to come up with unique ways to build awareness for StreetEasy’s tools and information, be it through announcements about real estate market trends that utilize data and market analysis from the StreetEasy Research team, sharing news about a business milestone or product update, profile building initiatives for our spokespeople, and more. “After Zillow’s acquisition of StreetEasy, there was discussion about how we were going to build out the marketing and communications teams there. I expressed interest in getting involved – after a few business trips to NYC, there was something about that city that stuck with me – and it evolved into relocating and heading up PR efforts for the whole brand. It all happened pretty quickly. StreetEasy was acquired in August 2013 and by the end of January 2014, I was moved out to New York. “It’s been my experience that Zillow is extremely supportive of upward mobility and, as our office footprint grew across the country, encouraged employees to visit other offices. In my case, I relocated entirely to take the experience that I gained at Zillow in Seattle and carry it over to a whole new division of the company. “It’s just as much about what you know as it is who you know. Yes, it’s a cliché saying that has undoubtedly been used time and time again when it comes to job hunting, but in this super competitive day and age I think it’s more applicable than ever. To this end, I would encourage students to attend networking events, and stay up to date on campus-hosted job fairs and guest speakers. Meet as many people as you can and follow-up on LinkedIn. Networking is something that you don’t grow out of either. It is very much a part of the real world, and it will be nothing but beneficial to practice while you’re still in school. You never know what connection will come in handy down the road. “Going on informational interviews was another concept that I snubbed when I was still in school, and I wish I hadn’t. After hosting a few informational interviews later on, I realized it was a smart tool for prospective employees to use. For one, it’s great interview practice. Secondly, it could lead to finding a good professional mentor. Lastly, it’s a great way for a student to get an idea of how a particular department with a company functions, and ask some questions about the company without the pressure of being a formal applicant. Remember to ask not only about someone’s responsibilities and their day-to-day tasks, but also work-life balance, company culture and why they enjoy working at the company. While having applicable experience certainly matters, I think someone’s success at a company has a lot to do with their goals, attitude, and values aligning with the company’s as well. If you can, work or study abroad. I learned so much teaching abroad right after college, my only wish was that I would have done that when I was still in school and didn’t have as many real world pressures impending. Now that you’ve had some time to reflect on your time at the UW, what advice do you wish you would’ve received while in school? “It may take a year or two or three, but think beyond your diploma, beyond your major. Think about people and companies that you admire. Think about how you want to earn a living and back into a major. Don’t feel restricted to the list of jobs on a website or in a pamphlet. If there’s anything I’ve learned in the last five years, it’s that you can earn a living doing almost anything. Some may take more work than others, but believe me, there are so many random jobs that exist and you can do them. “Secondly, college is such a unique, exciting time, and it is extremely easy to be distracted by social ‘funtivites’ instead of going to class or participating in an after-class group (me = guilty). College really is, however, unlike any other time in your life where you have the opportunity to be totally and completely dedicated to acquiring knowledge and laying a foundation for your future. Don’t take that for granted. Find a way to strike a balance between fun and your future. Get to know yourself, your tendencies, what topics and tasks keep you motivated and what classes you absolutely hate. Take advantage of the variety of classes, different campus activities, extracurricular interest groups, and even office hours with TA’s and professors. There is so much to learn. Be passionate, don’t be afraid to be ‘nerdy’ or do something different while you’re in school. It will all pay off in the end and folks who decided to be less productive in college will be kicking themselves when they read your bio five years later. “Moving to NYC still feels like a pretty recent (and exciting) pivot for me so it’s safe to say that I’m really focused on my career right now, and seeing the StreetEasy brand grow over the next five years. On the fun side of things, I hope I’m a fluent New Yorker who knows most boroughs – and their real estate markets – like the back of my hand. Professionally, I hope I can continue to expand my areas of ownership at Zillow Group and run a team as a VP of Communications down the road – or some derivative of that. If there’s anything this NYC move showed me, it’s that your life can change at the drop of a hat. All you can do is be open and prepared for every opportunity that comes your way. I definitely see myself in NYC for at least a handful of more years, pending any unexpected changes, so I want to continue to learn, develop and meet new people in my field. I’m fortunate to live in a global media hub right now, where a lot of influential companies are located, and I don’t want to take that for granted. “Despite all this talk about planning for your future, please don’t forget to have fun. Don’t get so buried in planning ahead that you forget to experience the present. College comes with flexibility for a reason – it can just take some time to find the right balance. If anything, make sure you enjoy a few Dawg Saturdays.